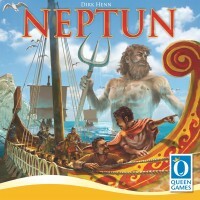 Neptun, by Queen Games and designer Dirk Henn, is a game for 3 to 5 players ages 8 and up and plays in 45 min. The game is played over three game rounds consisting of three phases. You take the role of a Roman merchant sailing the Mediterranean. Navigate the sea and coast to deliver on contracts you have acquired... but there is a catch (so to speak). You get to determine the order of your contracts, but they must be filled in that order. So as you are acquiring and placing contracts, you must take into account where you are traveling. When you fulfill a contract you receive either favor at the temple or gold, which can be used to buy favor but also may be used to extend your ship's range. Thus, gold can help you bridge that key leg of the journey so that you can deliver that contract in a timely fashion and be well positioned for the next part of your journey. By laying out your contracts efficiently and navigating the sea and coastline effectively, you will earn the most favor from the temples and win the game. Add a Review for "Neptun"